Carson enjoys the RAS Camp with Manu Samoa greats Schwalger and Stowers. 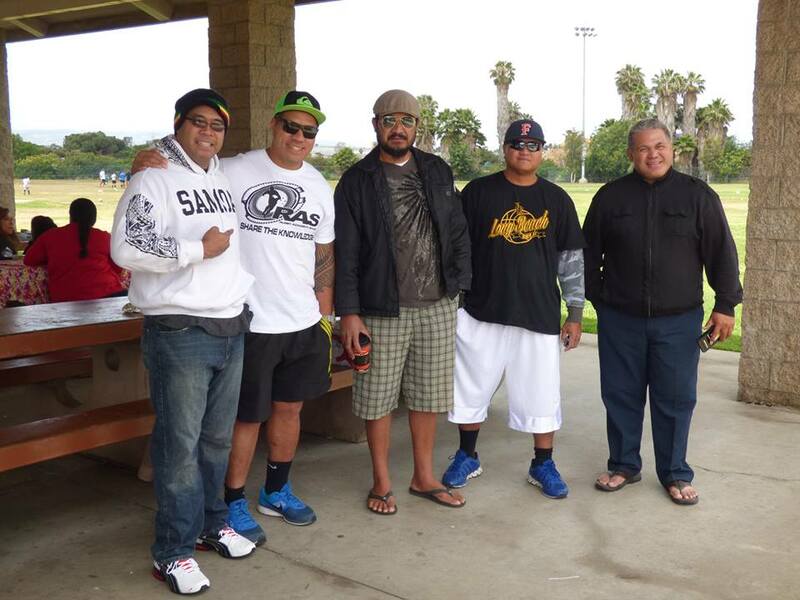 The First Rugby Academy held at the Victoria Park, Carson California conducted by Mahonri Young-Schwalger,George Stowers and Arthur Lesa of RUGBY ACADEMY SAMOA yesterday. Lemalae was able to take some pictures at the early stage of the training and talked with some parents who were there in support of their kids. The parents were commenting on how Rugby benefited them and their boys. Mother Susie Bautista said one of his sons was very timid and did not know where he fit in but Rugby is bringing a different person out of him. He is more active and has no fear of challenges, also they notice that their son is much happier and content now than ever. As for them, the parents, Rudy and Susie Bautista, they are even happier because now they find something their kids can play to get them off the street. They think the $30 entry fee was reasonable and affordable compare to other activities like football, baseball etc. The Bautistas also allow their young daughter to play in the girls Rugby team. One of the main organizers for this camp in Carson was Tuilapa Faafetai Su'a who also played for the Manu Samoa in the early 90s. He now resides in Los Angeles but his roots with the team was why they reached out to him and he was instrumental in getting them the location and facilities for the Camp which was very well attended by members of the Samoan community in Los Angeles. 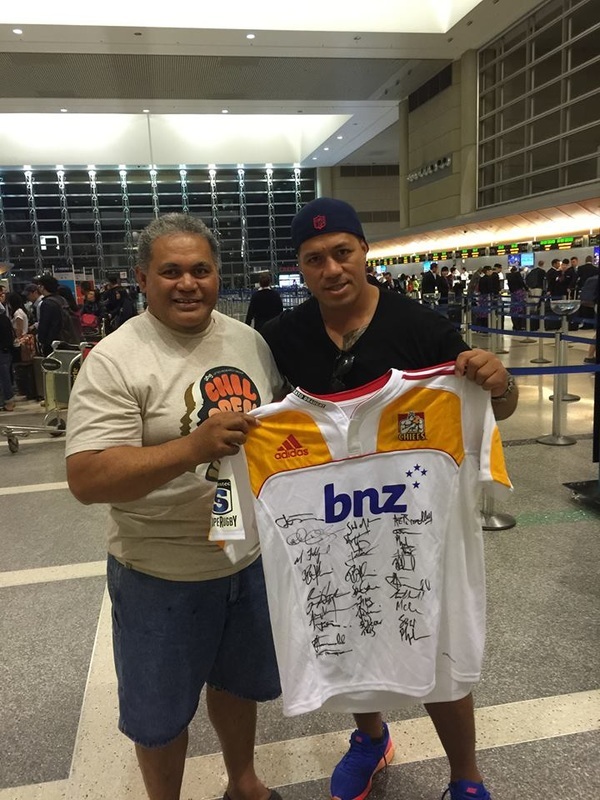 As they prepared to leave Los Angeles via their flight to New Zealand Mahonri Schwalger made a presentation to Tuilaepa Faafetai Su'a. It was a Chiefs jersey fully autographed by members of the team from the young Manu Samoa's hero, Mahonri Schwalger to the old Manu Samoa, Fa'afetai Su'a. Tuilaepa was very touched and said, "Thank you for the souvenir brother Mahonri...and most of all, thank you for sharing of the Knowledge of new Rugby, with the young ones here in the United States through RAS (Rugby Academy Samoa). What a program! The opportunity for young Samoans to learn rugby skills from some of the best to play the game, including Mahonri, George Stowers and Afa Lesa was GREAT. Hope to continue this relationship which money can't buy. I love that..... Safe travels to you all... Manuia." 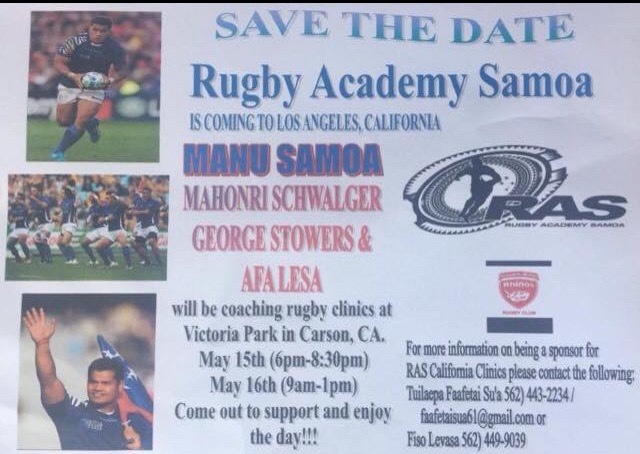 Manu Samoa greats Schwalger, Stowers and Lesa to give back to community with free rugby camps in Carson, CA on May 15-16, 2015. Please support. The Manu Samoa Rugby team has had many prolific players over the years. The captain of the last team which represented Samoa at the last Rugby World Cup, Mahonri Schwalger will be leading a number of Samoan Rgby players from that team including George Stowers and Afa Lesa who are in Los Angeles, California for a couple of rugby clinics to be held in Victoria park in Carson, California on May 15, and May 16, 2015. Please see flyer on this page. These players are promoting the services of Rugby Academy Samoa, an organization which was created to help promote rugby throughout the world. They are coming off of a tour of the East coast where they were in New York and Connecticut. They also were hosted by Salt Lake City, Utah last week and are now coming to the West Coast to continue this highly successful campaign which includes visiting teams and communities where rugby interest is high, and where they hold training camps for the young players from Junior High School to High School and college aged rugby players. The interest has been excellent and the support of the Samoan community has been well represented where they have been. 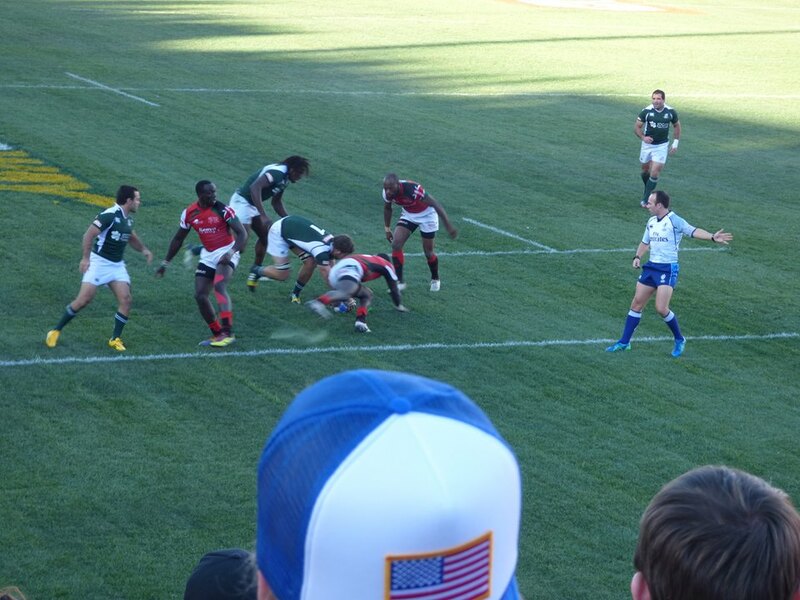 Its a great time for the promotion of rugby as the USA has begun to find its own way in the Rugby world. 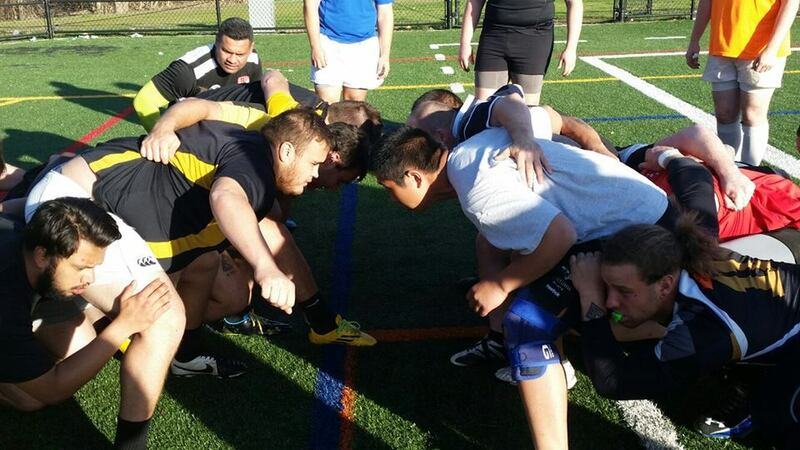 The US's Eagles rugby team has become more competitive in recent years and the interest of the American public is growing with High School and College Rugby teams becoming more prevalent. Rugby Academy Samoa has made quite an impression with this tour of the USA and they will definitely see a benefit to their organization with these events. For any parents who want to get their children exposure to the rugby skills as taught by Samoa's own professional rugby players, please go to Victoria Park in Carson, CA on the 15th of May at 6pm and then the 16th at 9am and take your children to experience this opportunity to learn from the best. Our very own Manu Samoa players are not easily seen in the USA so this is a very important opportunity for you and your children. We want to thank Rugby Academy Samoa for this amazing opportunity. We wish these amazing players the best as they continue to provide this service to our people and the rugby fans around the globe. Good luck and may God be with you. Nothing like having a successful fundraising- event. 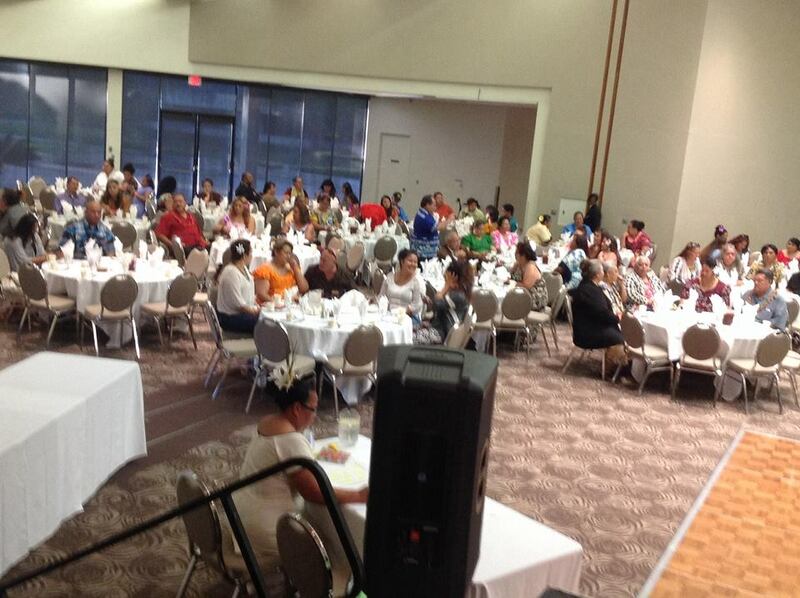 That was the consensus at the Carson Hall, in Carson California last weekend where the Taeao Fou EFKS church held their annual fund raiser while celebrating Easter with over several thousand members of the Samoan community. They had a unique idea of turning off the lights at the opening of the evening and the only light was a little lamp over the podium. You couldn’t hear a pin drop but the voice of the speaker and then Rev. Time. What a brilliant idea to open with a little quiet time for the Lord. It just made the evening extra special and different. Like British Prime Minister David Cameron said delivering his warm speech for 2015 Easter holiday, “Easter is time for Christians to celebrate the ultimate triumph of life over death in a resurrection of Jesus. Churches are not just collection of beautiful old buildings, but a living active force doing great works right across the country. When people are homeless the church is there with hot meals and shelter, when people are addicted or in debt, when people are suffering or grieving, the church is there”. Taeao Fou Congregational Christian Church EFKS was originally from Sapapali'I and started by 11aiga. And now it’s growing. People noticed the strong support from Rev. 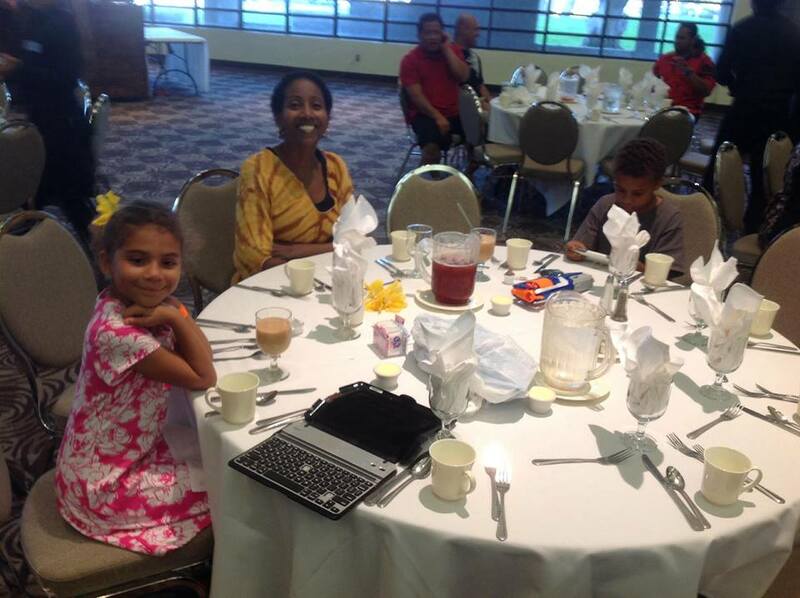 Tiatia and wife Eseta and their congregation. They joined the Taeao Fou Church and guests to eat and dance together. The $30 ticket was well worth the price with excellent food, beautiful show, as well as the entertainer Atoa Ripley singing who also contributed to spice up the evening. Verona Parker hosted the event and she was impressively talented throughout the evening. These pictures were taken before the opening - prayer as the participants were still entering in. It was mostly in groups of 6 or more who attended and this caused quite a queue outside to get in. The hall was packed so they had to add more tables to accommodate the guests. As the evening concluded it was evident that this was one evening people would remember and mark on their calendars for next year. Tuilaepa Faafetai Su'a, the event coordinator was extremely pleased with the turn out and the presence of so many well respected members of the Samoan community. There were members of the business community there also including Digicel. It was a classy evening that was made very enjoyable by the entertainers Atoa Ripley and the Original Band who performed the kind of music that is compatible with a classy night out. 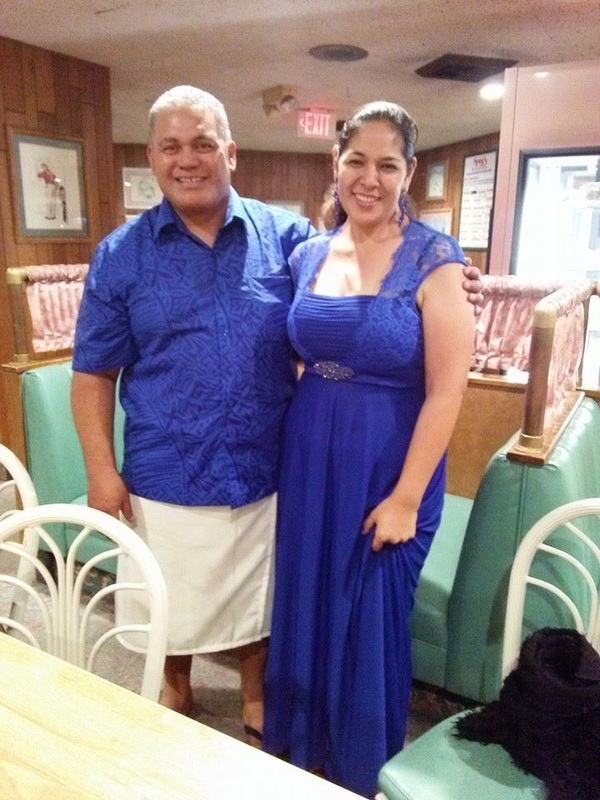 Verona Parker also was a hit as she hosted the event and showed her classy persona as the actress in some of the most popular Samoan movies out today including "Silamanino." Besides the great music of Atoa Ripley, the Taeao Fou Youth performed excellent cultural dances that were both beautiful and an example of how youth programs of the church are succeeding in helping these Samoan youth maintain their culture and pride as Samoans. The numbers of paying patrons were indeed impressive, infact the Carson Civic hall was unable to seat all the patrons who came out. There many who were turned away due to the lack of seating. 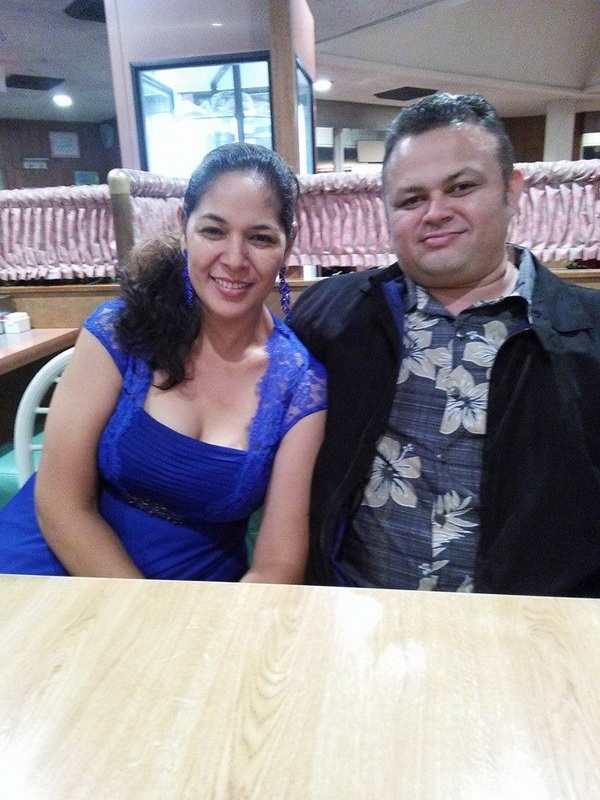 The night was one that reflected a special night for the Samoan community. This was evident because it was a well dressed crowd, the food was delicious and the entertainment top notch. Those who were there seemed to feel like this was the type of event they would enjoy more of. At the end of the evening many did not want to leave but were talking and socializing even though the security were trying to get them to disperse. The final amount raised was close to $45,000 and this would be going to assist the church in its programs for the youth, the needy and the other special needs of the congregation. 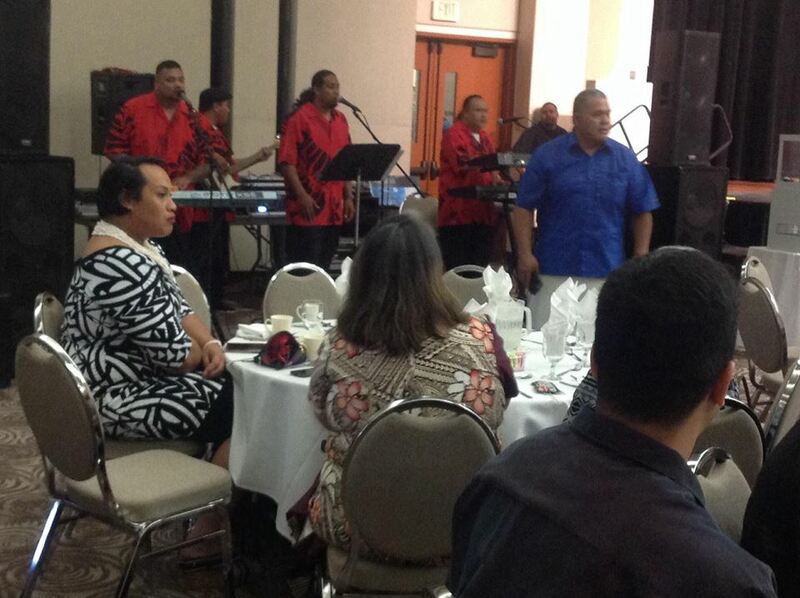 Congratulations to the Taeao Fou EFKS Church for such a successful and well put together event. No doubt next year they will need a larger hall to accommodate the crowd. 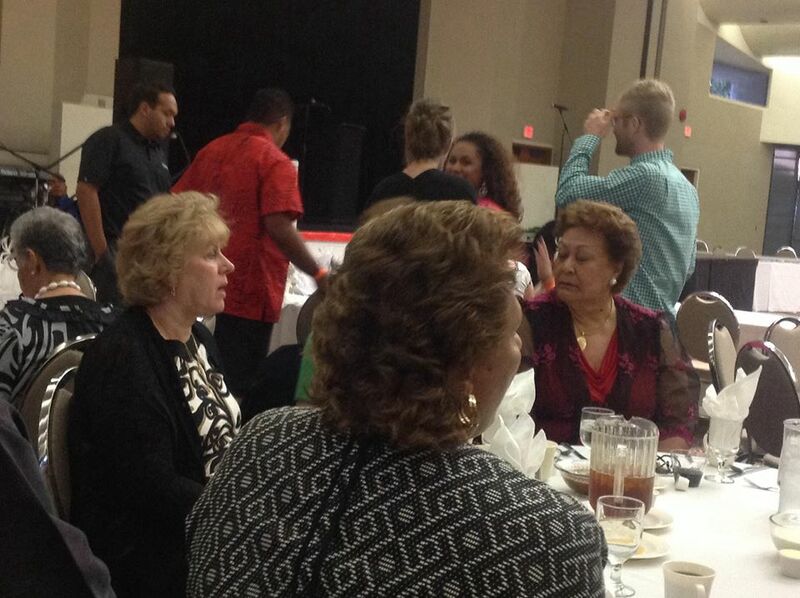 To'oa Papaliitele Malama Talamaivao celebrates her 72nd Birthday with Family and Royalty. 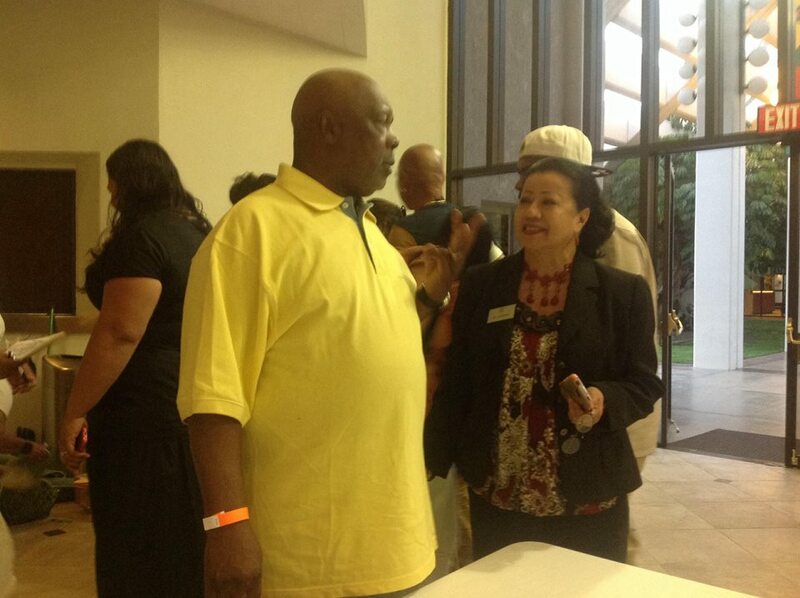 A very important event was held over the weekend in Moreno Valley, CA. 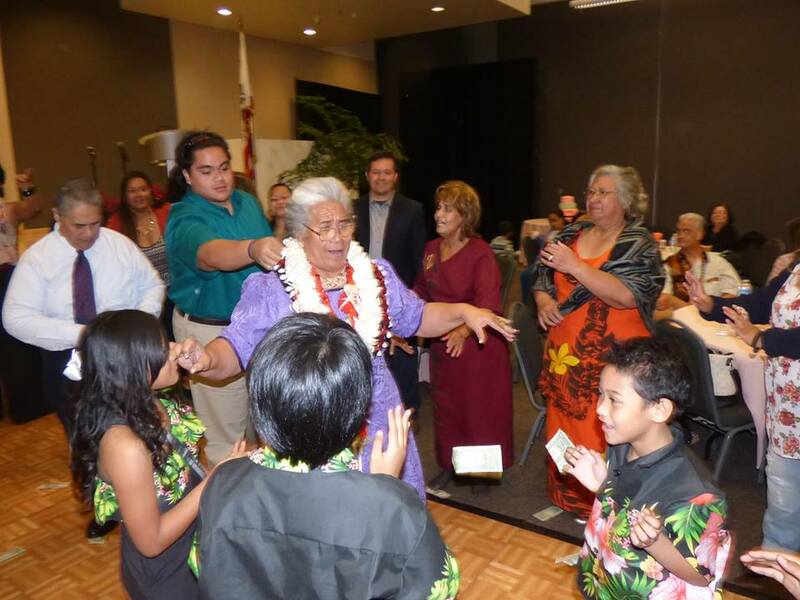 The children and grandchildren of Tooa Malama Papalii Talamaivao held an extravagant Birthday party for their Mother and Grandmother at the Moreno Valley Civic Center Banquet Room. This was Malama's 72nd birthday. She is related to the Malietoa family and is known as the favorite niece of the late Malietoa Tanumafili II. The guest list was as impressive as any involving Polynesians because at the head of the list were members of the Tongan Royal family. Among the guests were her highness the Princess Salote Tukuaho, the Honorable Prince of Tonga, Tungi Tukuaho, the Honorable Lady Alaileula Tukuaho and Prince Ethan Tukuaho. 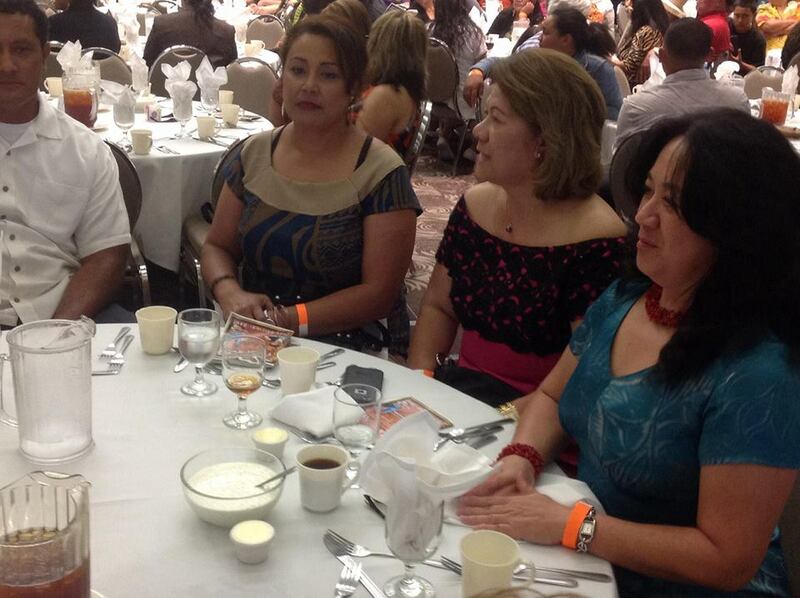 Other members of the guest list included leaders from various churches and businesses from the Los Angeles area. There were so many great entertainers who performed for the evening including some of the starters of the USC Trojan Football team led by Malama's own grandson and starting Offensive Guard for USC, Viane Talamaivao. Viane was joined by teammates Damien Mama and Juju Smith. Seeing To'oa Papali'i Malama Talamaivao close the evening with the traditional dance (taualuga) was a heart warming experience. She had been hospitalized with pneumonia complications a couple of months prior that forced her to bed rest to recover from her sickness. But her taualuga was a life affirming sight that was welcomed and applauded by all her family, friends and especially her children and grandchildren. These are some of the amazing photos from this great family event. 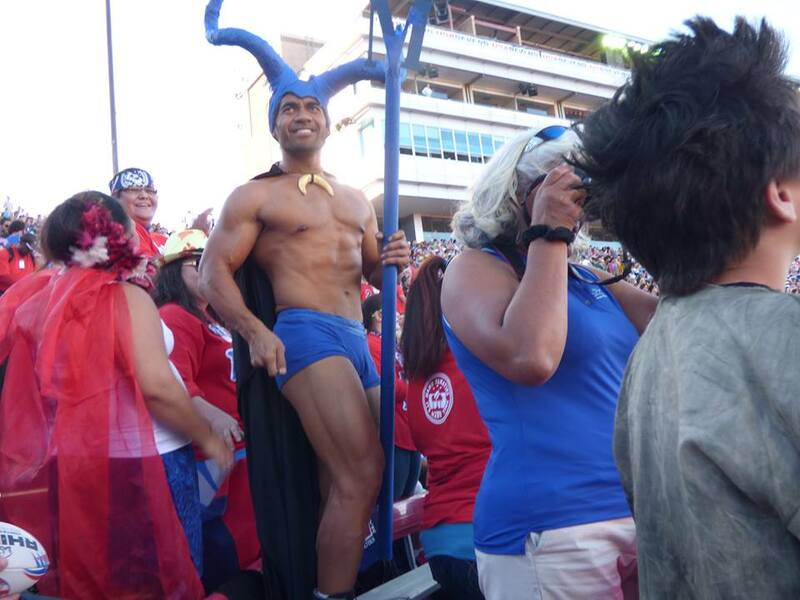 Manu Samoa performed their weakest performance this year, 2015 Rugby Seven tournament in Sam Boyd Stadium, Las Vegas ever. Their first two games on Friday showed their inexperience on the field as Fiji dominate the Manu Samoa by 36 points to 0 point. This is not Samoa, regardless the fact that every year the team experience having to play with new players. They have no stability, no foundation nor team play as they try to get used to the idea of getting used to each other and Samoa was hoping that it's just a phase and they could handle any situation and still remain a strong competitor in the Seven league in Las Vegas. Spectator noticed that the Manu Samoa players showed signs of hesitation once they get the ball. Watch Slideshow below for pictures taken by Samoans in LA Editor Mile Stanley. The Manu Samoa Rugby team got beat again by New Zealand by 15 points to 5 points on their second game. These are two powerful team of the league. On the second day of the tournament the Manu Samoa made up their minds to win a game. They won against Wales by 26 points to 16 points. Then Samoa beat Brazil. They woke up and go to work to win the game Samoa 26 points to Brazil 7 points. Then The Manu Samoan team got beat by Kenya 19 points to 5 points which knocked them out of the league. The tournament was dominated by Fiji against New Zealand at the end of the day. The score was 36 points 19 points. "O oe ma lau Taulaga " is a special once a year event where the membership of the Taeao Fou EFKS Church in Los Angeles, CA. hold a special night of excellent entertainment with sit down dinner and excellent food catered for those who attend. This event will raise money for the functions and operations of their church for the entire year. The tickets are $30 each but are very limited so purchase them now to secure a seat. This event is also where each family of the Church prepare their Taulaga or Offering of Thanksgiving, which is a commemoration of all the blessings the family has received throughout the year which they convert into money and is donated to the Church. Taupous will present each family's Taulaga. The presentation of Taulagas will be contextualized in all instances applying the Samoan cultural presentations of significance such as Ifoga, Talomua, Si'i alofa, Suata'i and Afiafi o Aiga throughout the evening. So this will be a very dramatic and culturally enhanced evening. But more importantly this is a heart felt offering given with free will and happy hearts by members of the congregation. 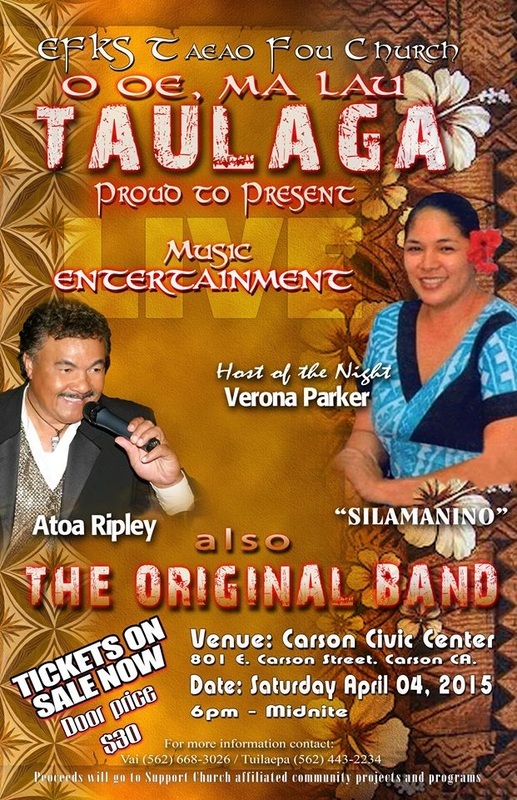 This year the entertainment is provided by Atoa Ripley, a versatile entertainer who has performed for over 40 years starting in Pago Pago, American Samoa. he has since moved to the East Coast of the USA where he has performed for over 20 years. He will be joined by the prolific Original Band. The host for the event is the one and only Verona Parker who is the star of Silamanino. Verona Parker was also Miss Samoa and Ms. South Pacific between the years of 1996 and 1997 but is now an actress appearing in the popular series Silamanino. 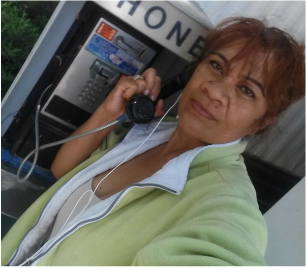 Ose fa'afiafiaga tele ua sauni atu iai le au lotu ma ua latou fa'afeso'ota'ia le susuga ia Atoa Ripley, o ia o se tasi o alii pese lauiloa i Samoa ae maise foi i inei Amerika ina ia fa'afiafia i lea po. O le a fa'apea fo'i ona fa'afiafia ai le fa'aili ole Original Band mai Los Angeles. A'o le ole a fa'afoea lea afiafi poo le MC o le tama'ita'i o Verona Parker mai le ata tifaga ole Silamanino mai Samoa. Samoans in Los Angeles Editor, Mile Stanley was at the AIGA Foundations big Polynesian All American Bowl last weekend and she took photos of the players, the fans and the celebrities at the game. It was a great game and the families of the players who came from all over the USA were totally entertained. We acknowledge AIGA Foundation's mission to help Student Athletes to further their education by improving their chances to get Football Scholarships as they graduate from High School to College.